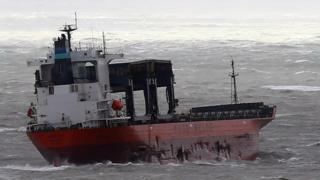 A 200m-long cargo ship hit a barge full of rocks in the English Channel, as Storm Angus battered the south coast of England with high winds and heavy rain. Eleven of the 23 crew members were evacuated by helicopter after the ship got into difficulty off Samphire Hoe near Dover. The other 12 members remained on board and are working on getting the vessel to a safe port. Storm Angus is the first named storm of the season. The Saga Sky was dragged into the rock barge by severe winds after losing all of its engine power. The coastguard declared the situation "a major incident", with two helicopters involved in evacuating crew members and a French tug sent to assist the stricken ship. Andy Roberts, an RNLI volunteer with the Dover Lifeboat House, said although the Saga Sky was damaged and had been taking on water, there was "no sign of pollution" in the surrounding waters. After regaining some engine power, the ship was able to move to a safe anchorage at Dungeness, according to the Maritime and Coastguard Agency, and the focus is now on moving it to a more secure port of refuge. Storm Angus has brought gusts of up to 106mph - recorded 23 miles off the coast of Margate - while gusts hit 80mph at Langdon Bay, both in Kent. Media captionStorm Angus has left us behind but things are not calm quite yet. More than 1,000 properties in the south west of England - the majority in Devon - were without power, according to Western Power Distribution. Almost all power had been restored by Sunday afternoon. On Sunday evening there were five flood warnings in place across England and Wales, down from more than 25, including one severe, at the storm's height. Angus has now moved out into the North Sea, but bad weather is set to continue into Monday. A further three Met Office weather warnings have been issued for the beginning of the week for Wales and the south-west and north-east of England, which can expect heavy rain and winds of up to 50mph. Devon and Cornwall Police declared a major incident overnight because of flooding at the Mill on the Mole residential park, South Molton, at 04:15 GMT, but residents who had been evacuated were able to return by 05:50. Devon and Somerset Fire and Rescue Service said some properties in Braunton and in Bradiford had been flooded. 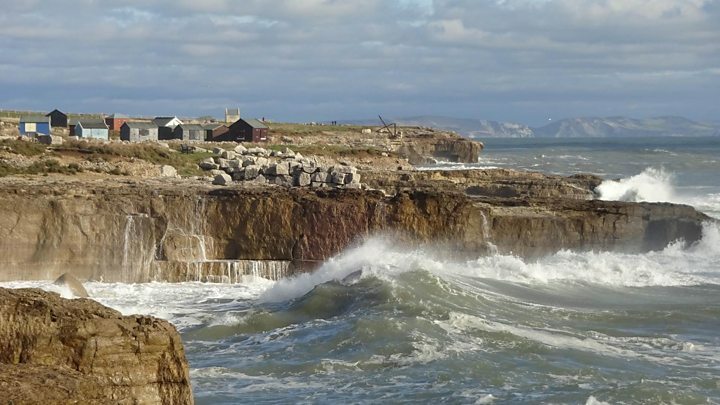 Meanwhile, fire crews were called to flooding to roads and "multiple properties" from sea water in East Bar, Swanage. In East Sussex, organisers of the Brighton 10k tweeted that the run had been cancelled because of the high winds. And in West Sussex. 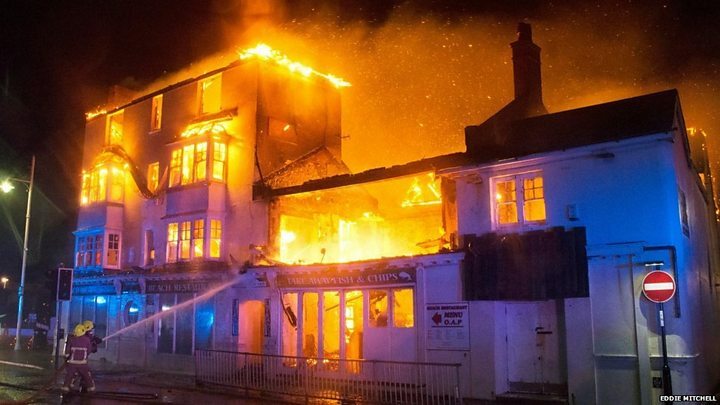 fire crews tackled a "major" fire on Bognor Regis seafront in the "difficult conditions" brought by Angus. The Port of Dover suspended ferry crossings earlier due to "very high winds" but this was later lifted. Network Rail said the weather had affected train services across the south east, but the majority of lines were now open. The storm's effects have also been felt in the Channel Islands, with a wind gust of 84mph recorded in Guernsey and gusts of up to 87mph in Jersey. Do you live in any of the areas affected by Storm Angus? Get in touch and email haveyoursay@bbc.co.uk. Email your pictures to yourpics@bbc.co.uk, upload them here, tweet them to @BBC_HaveYourSay or text +44 7624 800 100.